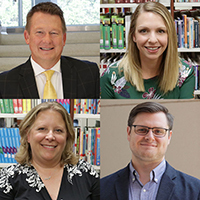 The School of Education welcomed four new faculty members in the fall of 2018, and a new librarian for the Learning Resources Center joined the faculty in the spring. The SOE is currently searching to fill five faculty positions for the Fall 2019 academic term. For more information, visit baylor.edu/SOE/facultypositions.